Villa Eilenroc is located on prime property in the Cap d'Antibe. It is a house open to all that gives you insights about the lifestyle of the elite and famous on the Cote. The scenery of the surroundings is remarkable and the house is built with magnificent architecture. Between the villa and the coast is a 3.7 kilometer walkway path. If you take this path you allow yourself to enjoy the panoramic view of the Cap d'Antibe and the villa. Villa Eilenroc is not open on rainy days. The villa is only open on Wednesdays and on the first Saturday of every month. Entry is free for kids. How popular is Villa Eilenroc? 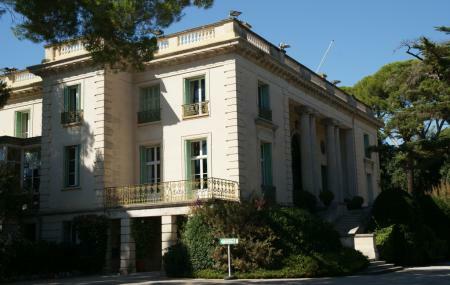 People normally club together Marche Provencal and Musee Fragonard while planning their visit to Villa Eilenroc. Nice historic villa with a great garden with a beautifull view on the " millionairs bay". When open try to catch the sunset! What's incredible after the visit of the magical gardens of Villa Eilenroc is that you can go to this little closed beach for a swim. Looks beautiful from outside the gates but unfortunately it was closed despite the website saying it was open. Call ahead before you go. I gave it only one star because it is STILL CLOSED. I spoke to workers April 25th and apparently they now hope to open at the end of May.